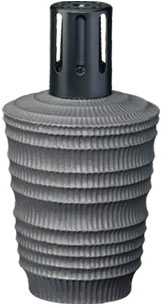 Lampe Berger's unique bark lamp is a study in texture with nice masculine appeal. It is a wonderful lamp that takes us outdoors! The lamp is supplied in a nice Lampe Berger gift box with a burner, funnel and instructions. Lampe Berger has retired this lamp.